Ever since I was a child, I was fascinated by Paris (and Eiffel Tower). Recently, I had opportunity to visit Paris, albeit for just a few hours (I had a 12 hour lay-over in Paris between flights). 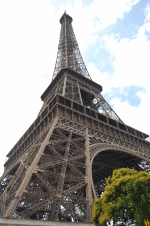 I went to see the Eiffel Tower and it looked just as beautiful and majestic as it did in my imaginations.